I’d like to share a few images of the latest bookwork produced at Caveworks Press. 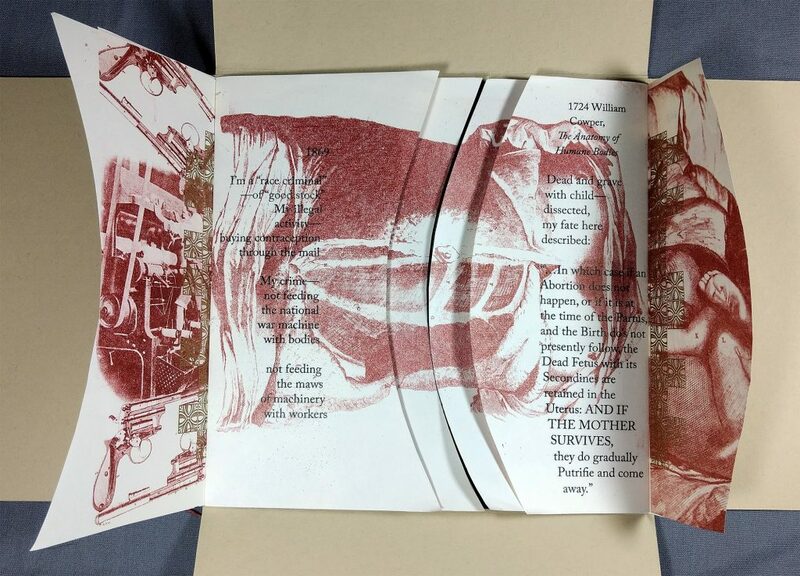 I was selected to participate in Handy Books, an exhibition at the University of Iowa Center for the Book. Each artist was matched up with two books for inspiration. My two were Anatomy of Humane Bodies, William Cowper, and Nos Amis, Jean Matel. The one of a kind version is currently on exhibit at the K.K. Merker Gallery in North Hall. Click here to find out about the Symposium and the exhibit dates. This version is made with Mohawk Superfine instead of painted Tyvek. It is a variable edition (since the one of a kind exists) of 3. 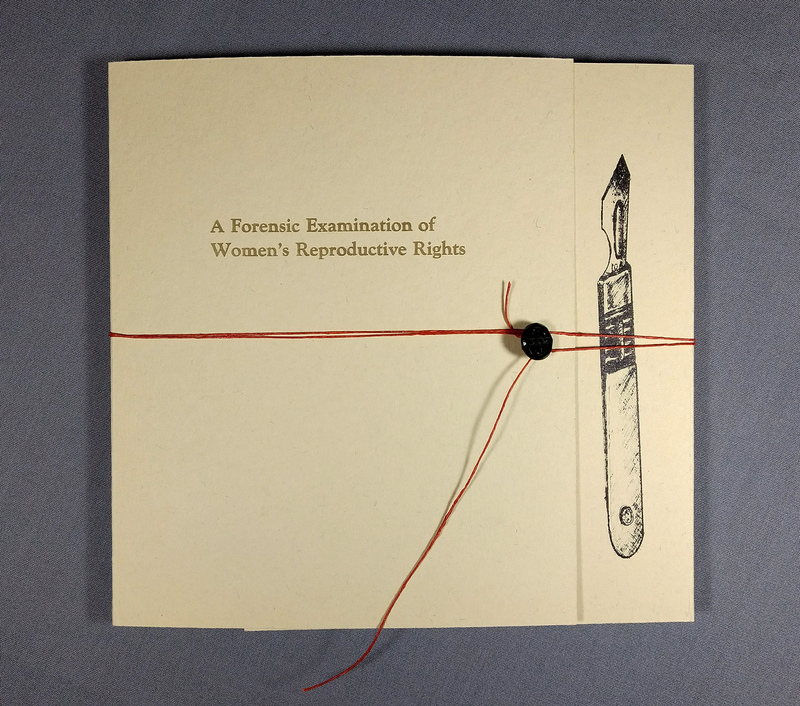 “A Forensic Examination of Women’s Reproductive Rights” is made with both hand drawn polyester plate lithography and direct copies of engraving from Cowper’s book, which are laser printed onto the polyester plate for lithography printing. 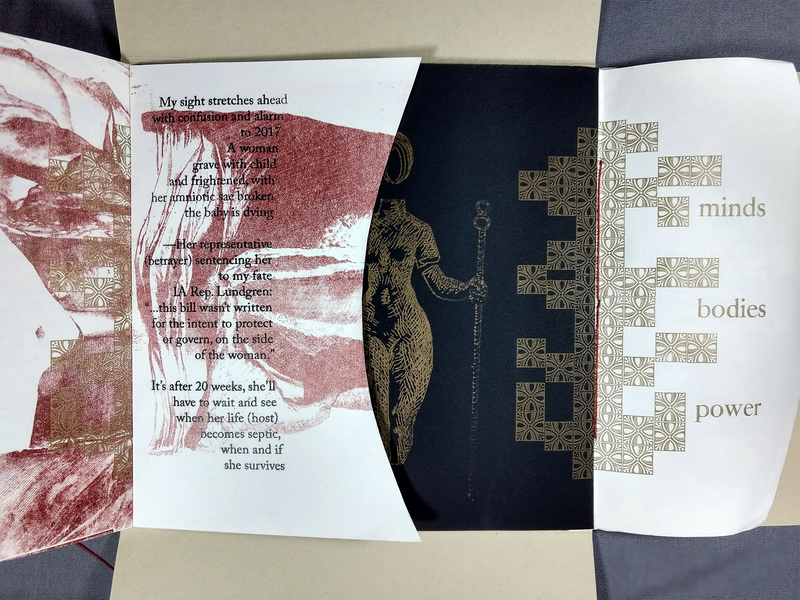 I don’t have an etching press, so I used my Vandercook Proof press to produce the lithographs. There is also hand-set metal type and ornaments printed in gold ink. The structure invites viewers to explore into the body’s folds, revealing stories in women’s reproductive rights, as well as tangential areas like perception of women’s power and autonomy. The pregnant torso image is from Cowper’s book ( plates drawn by Gérard de Lairesse and engraved by Abraham Blooteling) as well as an interior image of the fetus revealed in the woman’s body during forensic examination. There is also a direct quote from the text which struck me immediately as having a modern counterpart to the discussion of carrying a dead fetus to term, made famous by IA Rep Shannon Lundgren in spring 2017. 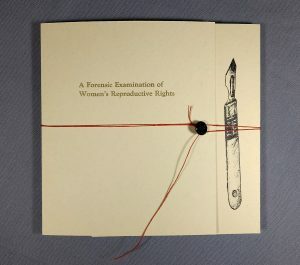 As the structure dictated an arrangement of content, my challenge became what content to choose from the vast array of information on the history of women’s reproductive rights. I was also thinking of the other inspiration book, Nos Amis, a French children’s book made of cloth that teaches the names of things. I began to think of how women are labeled for their reproductive choices. While not as blatant as labels on pages, the text I wrote does incorporate an awareness of how women are named and viewed by the society at large. The text became personal stories in loose poem form. After trying to write in a “historical” language and failing, the successful voice became individual experiences transmitted over time. The personal is political. A cloth-like or skin-like (referencing the Nos Amis book) polyester paper Tyvek was used for the book block. 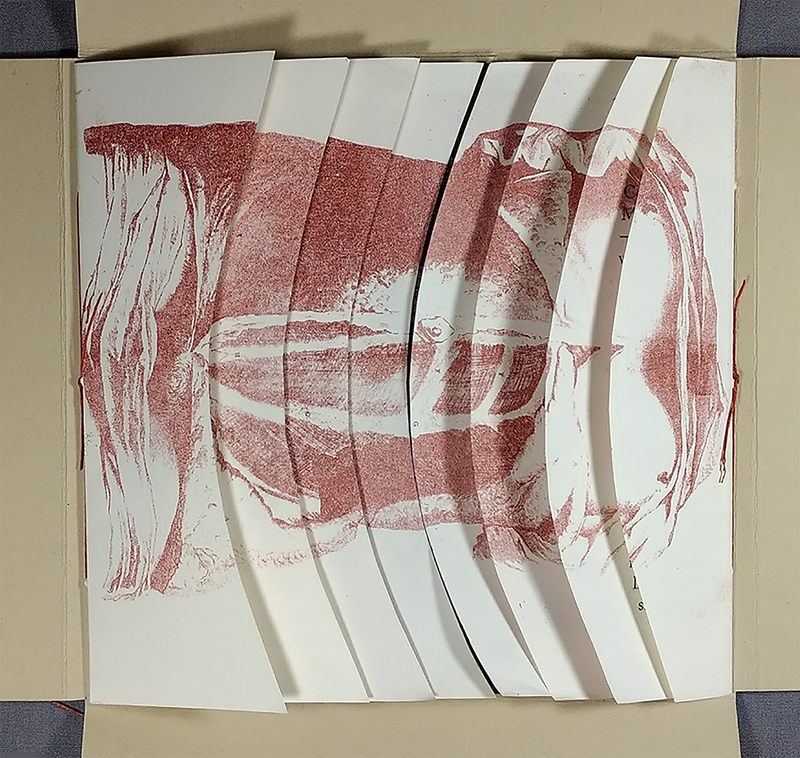 It was painted with an acrylic wash in flesh/blood colors after printing to bring out the fibers. The imagery was produced by polyester plate lithography and letterpress on the Vandercook press.